Large areas of grassy lawns are ideal sites for farming, including public parks and some corporate and government buildings that are fronted by wide lawns. Some of these areas should be reserved for grazing by livestock if they are adjacent to small buildings that can be converted into barns and coops (see 1:7). The rest will require thorough tilling to break up the grasses and expose fertile soil for planting crops. One method of removing the grass from lawns to have useable growing soil is to physically remove all the grass with spades and shovels, and composting all the grass. This is a labourious method which yields instant results and provides a massive starter for compost if there is a shortage of it. Using a flat-edged shovel, cut the sod into 1-foot squares or larger, then pull up the top layer of grass with a shovel or spade . Transfer to the compost system. This can be done at any time of the growing year, preferably in the spring. Another method is sod conversion, which decays the grass converting it into soil. This method requires many months in order for the sod to break down, and so is best done in the fall to have soil ready for the following spring. Cover the entire area of lawn with a biodegradable material like newspaper, to block out the sun. Add a 6-inch layer of compost or soil on top of the newspaper, watering on top of newspaper and compost/soil layers. A third method of composting lawn is by creating turf loam. In a soil pit, line the bottom with one layer of lawn grass-side-up, and top that with a layer of lawn grass-side down, so the grass surfaces face each other. Repeat this with one more layer, then cover with a top layer of soil (saved from digging the pit). Allow to decompose for several summer months or until preparing seedling flats the following spring (see 1:3). 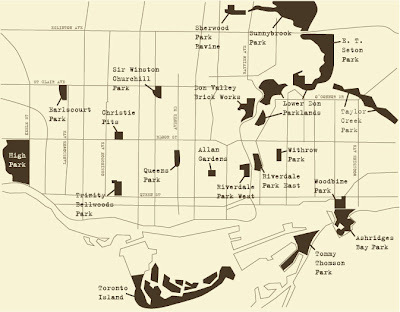 Below is a map of lawn spaces in Toronto that are at various stages of being converted into farmland. Although crops will grow with just the water provided by rain, it will yield much smaller quantities and sizes of produce. Irrigation is necessary in this climate, and outlined below are sources of water, how to collect and transport water, plus irrigation systems. Pollution is the main factor concerning water sources in the city, but unfortunately this problem is widespread. The water available will need to be used for irrigation regardless, but it will affect the quality of the produce and in any case should not be used for drinking or cooking without treatment (see 1:2:iv). All downtown tributaries were buried over a century ago, leaving only the Don River at the east edge (much too polluted to use for crop watering), the Humber River at the west end (both too far and too marshy for irrigation), and Balfour Creek at Yonge and St. Clair (almost dried up). In cases where farmland has no access to water bodies, rain can still be a main source of water, but collected to be used in an irrigation system. This is rainwater harvesting, a simple technology that greatly suits this city’s current situation, for farming as well as daily consumption. In the case of High Park, there is a water source directly connected to the farmland. In cases such as this, irrigation systems can come from the water source using a conveyor system to carry water up from the water source to a holding tank. The tank must be elevated higher than the highest spot on the field, as gravity and water pressure will propel water through the water hose. Connect the hose to a tap at the bottom of the tank. Alternately, use the tap to fill buckets or other containers to carry water to fields that are far from water sources. 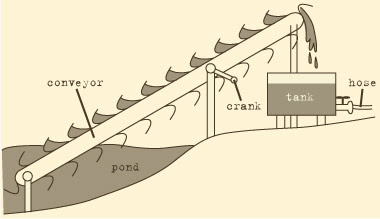 See section 2 for methods of harvesting rainwater. For passive irrigation based on water pressure, install a drip system of interconnected hoses (preferably between 1/8” and 1/2” diameter) with holes punched in even increments to let water leak onto fields directly at plant bases. Large public spaces will provide the majority of produce and pasture land needed for the citizens of Toronto. To maximize production of foods and herbs for consumption as well as medicinal purposes, it is best to convert unused outdoor spaces in homes, buildings and neighbourhoods, into productive areas. Domestic yards of grass or soil are obvious sites for growing a garden. 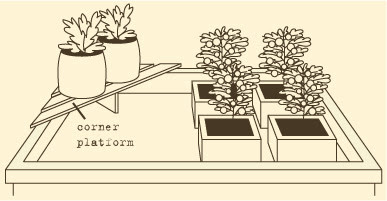 For non-soil areas, plants will have to be container gardened. All flat, accessible rooftops can be converted into garden spaces. However, due to the weight of soil and water, not all rooftops have the adequate load-bearing support right on the roof. They will, however, be sturdy enough at the perimeter that large metal grates or planks of wood can rest on. The containers will have to be large enough to grow plenty of food, and also to not fall over strong winds common to elevated areas. These areas have sturdy concrete or wood floors and high barriers are built for extra weight, therefore can house large gardens in constructed boxes or found containers. This also applies to rooftops with concrete or decked surfaces. Fire escapes are harsh environments for growing plants due to the wind, intense heat and dryness. Container plants in these areas need much watering, and some plants are more suited to this setting than others, including lavender, marigold, rosemary, tomatoes, and tomatillos. I would place your "alternative" soil preparation first. Laying cardboard or newspaper over sod is an excellent method of transforming it. You have to top it with something, but at minimum sticks to hold it down will do. It's true that you have to start in advance. But if it's possible, it's the way to go! You might want to make some mention of simple gathering of wild edible and medicinal plants and other resources. Even in a city, there are many "weeds" growing which can be harvested to good use. Deadfall gathering or coppicing for fuel and materials, etc. It takes time to turn over new farmland and, in that space, it is critical to gather what can be gathered, spreading the information needed to identify and use the plants successfully far and wide.